Bamboo orchid flower – When does Bamboo orchid bloom? Which color Bamboo orchid flower? 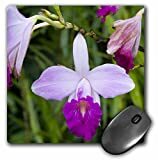 Bamboo orchid flower bloom summer to autumn flower color can be: purple, white or pink, the flower can be in more than one color it can be stripes, dots or shapeless.